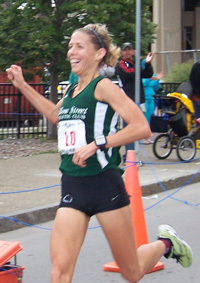 Lori Kingsley of Wysox, PA is a relative latecomer to running, but in short order she has distinguished herself as a standout masters competitor at distances ranging from the 5K to the marathon. She won the women’s masters title at both the USATF 15K and Half Marathon Championships last year, as well as running sub 2:47 at Boston. Lori managed to run a 2:51 at the Masters Marathon Championships at Twin Cities while fighting off a raging infection due to an abscessed tooth. She was second masters in December’s National Club Cross Country Championships, only the second cross country race she had ever run. I wanted to start with the National Club Cross Country Championships, which were a couple of weeks ago. It looked like you had a really good run there. Can you talk a little about that race? Had you expected to do that well? It’s only the second time I’ve ever done cross country in my life. I didn’t do it in high school. I didn’t do it until I joined the team last year. They were talking about it and, you know, I’m always up for something different. I love racing. I just love to race. I thought, “Oh, this will be something fun. Something to go [do] with my team.” When you had sent out a notice about any races coming up for us, I didn’t even think to mention it. First of all, I didn’t expect to do that well. Secondly, it was just kind of, “Eh, I’m going to go with my club and do it.” But it unfolded really well. The woman that actually won it [Lyudmila Vasilyava], I didn’t know anything about her and thank God I didn’t. When I go into races I don’t typically look at who’s up against me. I’ll recognize names, or see people and know they’re really good. But I’m not one of those racers that look at the names and what their current status is, you know what I mean? I want to do my own races and not worry about who else is there. Plus I can get myself…like, “Oh, she just ran a 16 minute 5K…” So when I finished, this elite coordinator came up to me and said, “Did you realize?” She’s from Russia, but she became a US citizen. She held the [outdoor] 1500m world record at one point; she ran a 4:02. So she beat us in the last 400m, which is understandable. Yeah, I think with that piece of information, you should feel a little bit better about that! Yeah, I did. The three of us came in pretty close together. I looked at both of them and said, “Thanks for a great race.” It was fun. You came in second in the 40-49 AG and you were only about 10 seconds behind Vasilyeva. But there was a great series of pictures that someone took, and I don’t know what point in the race this was, but all three of you were running together up a very steep hill. What’s so notable about them is that you look really calm. You don’t look like you’re straining. You look completely in control. Yeah, I felt that. I did. I never felt that I hit that lactic acid — you know, you get that burning. The second time we hit that hill, I did feel it — I knew my legs had worked. And then in the last 300m, I came down into the chute and looked at my watch, and it said I was running a 4:16 pace. So I knew that in the last few hundred meters, I just pushed really, really, really hard to try to hold second place overall. So, yeah, it was fun! I’ve never done a cross-country race. I want to try one this year. It was fun. In the last few years I’ve been trying to get myself to do different stuff, just to keep it interesting, not stagnant. Will you return to this race next year? It’s out in Washington, so it depends on the team. Some of them would like to go. I told them I’d like to go. The four of us who went there are the top four runners on the team, so that does help. One of our runners — who’s 45 and runs in the mid-18s, so she’s a good 5K runner, even though that course is 6K — she came down with the flu that morning. My other teammate came in fourth and she’s the one that won the 5K US Championship. So your team is well-placed in second overall for the masters category. Let’s talk about your athletic background, as it were. It sounds like you didn’t have much of one before you started running. [Laughs] It’s kind of sketchy and not good. Well, it doesn’t seem to have mattered that much. I smoked in high school. I went out for track for something to do. We moved to this area and it’s a small, rural area. I went from living outside Indianapolis with a class of a hundred or so students in my class alone to 120 in the whole school. It was such an adjustment. You know how you try to find your way in? I found that athletics could be my channel in making some social connections. It’s just very hard to move to a small area when the groups are gelled up pretty well. Julie Wankowski is training partner to fellow hopeful Tammy Lifka. I had this interview on hold for awhile as Julie worked through a period of recovery from a hamstring injury that had put a crimp on her training over the summer. Now she’s back, racing well and hitting triple digit mileage in her buildup to the California International Marathon (CIM) in December. So let’s start with the race [The Chicago Half]. Tell me how it went. Anytime you win your age group in a major race, you have to happy, right? It was just under 1:28. I was hoping for a little faster time. But, realistically, I honestly didn’t know what to expect because this was my first big race post-injury. I did a 5K the previous weekend. That went okay, but I was having some minor discomfort in my hamstring. I was really trying to stretch and do my physical therapy. So I got on the line Sunday morning and kind of went for it. I was really happy with how it went. Did the hamstring feel good during the race? My hamstring felt perfect. I did go out a little too fast, so my splits were a little all over the place, but not too bad. My 10 mile split was 1:06 and then the final time was high 1:27s. That tells you that my last 5K was off. But considering that this was a 10 mile PR for me too, that’s a great thing. So I’ll take it. Apart from the age group award, which is great, did you have a goal time for the race? Actually, I didn’t. I just wanted to do this race to get a race under my belt and have something good happen. Just kind of get back in the game. Because I was racing so well in the spring, and then I had the injury. I had to cancel all of my racing plans for the summer. So, while I knew I wasn’t ready to race well, I wanted to get back on the line. I wanted to get that hunger back. I’m running another half [about a month from now], so this was to get a baseline, see where I’m at, and go from there. Sounds like it was a good test run. Not only to see where you were injurywise, but also as a good confidence builder. Oh, exactly. I left it all out there, that’s for sure. That’s what you’re supposed to do! I liked how in the background materials you sent, you referred to yourself as a “racer.” A lot of runners make a distinction between being a runner vs. being a racer. How do you define that difference? For me it’s two things. One, I have to have a goal. I’m extremely goal oriented. Sales is a good example. I had a sales career for many years. Every year, you have to have x number of dollars in sales. So having a goal to work toward has always motivated me. If I’ve got a marathon, or even an 8K that I’m training for, that helps focus me. And, two, I’m very competitive. I’ll compete in just about anything. I love the competition. When I get on the line, I just want to do the best I can. It’s hard to say why I’m that way. I think it’s in my blood. Did you always know this about yourself? Growing up, playing games and stuff, I always wanted to win. I think my family would concur with that, as would my husband. I’ve always been very driven, kind of an overachiever. That kind of goes well with the racing. When Running Times asked if I wanted to write an article for their Masters section for the November 2010 issue — a profile of a masters runner who had already qualified for the 2012 Olympic Marathon Trials — I jumped at the chance. But there were two catches: they wanted a woman who’d been a relatively late starter and was a first-time qualifier. After doing some quick research on who’d qualified already, Karrh, who lives and trains in Marietta, Georgia, emerged as the sole prospect who came remotely close to fitting those requirements. Fortunately for me, she was willing to be the subject of a profile. The complete interview appears below. One word of warning about the audio version: Skype, in its infinite wisdom, decided to install a software update during the interview. So at the tail end the audio goes haywire as my bandwidth becomes clogged and it’s nearly impossible to make out what Karrh is saying. I salvaged what I could. Also, my apologies for starting things off with mundane chitchat about the weather. You ran the mile and two mile in high school. Then you say you got burned out after that. Can you talk about what happened to you post-high school? I was training pretty intensely. Basically, track and cross-country were my life at that point, all through high school from ninth through twelfth [grades]. I went to Abilene Christian University in Abilene, Texas. By the time I got there I was thinking I would be running. I got a few scholarship offers from various schools. But I ended up going to ACU not on scholarship. But I realized, number one, how nice it was to have a little bit of freedom. I was so regimented during high school – practiced and ran all the time. And I was burnt out. I continued to run. I’ve always run, since I was 13. I’ve never really taken a break except for pregnancies. I didn’t compete at that point. I would run a couple of little races here and there, just fun things. But nothing competitive. There’s a huge, long stretch of me not really racing – other than going to the little 10K here and there. I would just get up and do my own morning run, but nothing competitive, really, until recently again. What got you competing again? Your record starts at 2003, with some 10Ks. What happened that year? I had four children in 5.5 years. So I just started getting back into it, just really enjoying it again. Also for sanity purposes – it was kind of my only moment away. To be real honest with you, I have some natural, God-given talent here. I’ve always enjoyed running. I just decided to crank it up again. And, thankfully, I’m able to do that when I want to. So, it’s kind of been a series of events and a natural progression. Heather May, originally from Indiana, is currently speeding along the tenure track at Auburn University in Auburn, Alabama, where she is Assistant Professor of Theatre. Heather hails from a family of professors, which shouldn’t surprise anyone who talks with her for more than a few minutes. A passionate advocate of restoring the arts’ and athletics’ previous status as staples of this country’s core educational curriculum (see sidebar), Heather qualified for and raced in the last two marathon Trials. Having recovered from knee surgery last year, she’s now attempting to balance 85-100 mile running weeks with 65-80 hour work weeks in her quest for a third Trials bib, this time as a masters runner. When we were first in touch a few months back, you’d put your chances of qualifying at 15%. Do you still think your chances are that slim, or do you feel any sunnier about them? I’m going to hold out on being sunnier until after Twin Cities [October 3, USA Marathon Masters Championships]. Right now I’d still put it at around 15%. And that’s for a variety of reasons. One is that I have a very limited personal window. And it’s gotten shortened by the knee injury last year. The timing on that couldn’t have been much worse. I had in my head that I would train through the rest of 2008. I had hoped to chop a little time off [of my marathon best] at the end of that year, but that didn’t happen. So I decided to have one last blowout of running before I went into nine months’ straight of directing. When I’m directing I’m not only teaching two classes, advising students, sometimes doing independent studies — but I’m also in the rehearsal hall from around 6PM-11PM six nights a week. I do run. I think I probably managed 40-60 miles a week during that time, but it’s definitely not organized, structured training. It’s more to just stay sane. So I’d said that that was my year to do [an ultra] — May 2009 — because if I got injured it would be fine, because I was [going to be] taking all this time off [from hard training]. Well, unfortunately, I’m pretty sure [that race] caused the injury. Or at least started some problems that I didn’t know were there. And then, literally the week before my third of three shows closed, when I was planning to start training at the end of September, early October for Grandma’s Marathon in June of this year, my knee blew up to three times its normal size. It was a meniscus tear that precipitated the surgery? Actually, we didn’t find the meniscus tear until we went in. I knew I was having a lot of synovial fluid problems with the plica, so I had a lot of scarring on the plica. That’s what we thought was causing all of the problems. So I went through about six weeks of physical therapy because people kept saying, “People run on plica syndrome all the time, it’s not a problem. If you can, you can try to get it back down and run on it. We’ll be happy to do surgery, but you should try this first.” After six weeks the swelling hadn’t gone down in size at all and I couldn’t bend it. So at that point I just wanted to go in and get it scoped. So your pessimistic attitude about qualifying isn’t related to the knee per se, it’s more about your other demands intruding? Yes, absolutely. My timeline. Because once I get through Twin Cities, I go into rehearsal the very next day. October 3 is the race, October 4 will be my first day of rehearsal for the fall show I’m doing, and that will open the week before Thanksgiving. So I have, I’d say, nine months next year where, if a basically swear off life, I can train for one shot. At a maximum, I can train for Grandma’s [June 2011] and if I crashed there, hold on or retrain for Chicago [October 2011]. After that point I go back into a heavy schedule for everything else. So basically it needs to happen by early next fall or I just don’t see it happening. Jill Howard has had truly an “on again, off again” relationship with the marathon, having run her first in 1996 and her second in 2007. 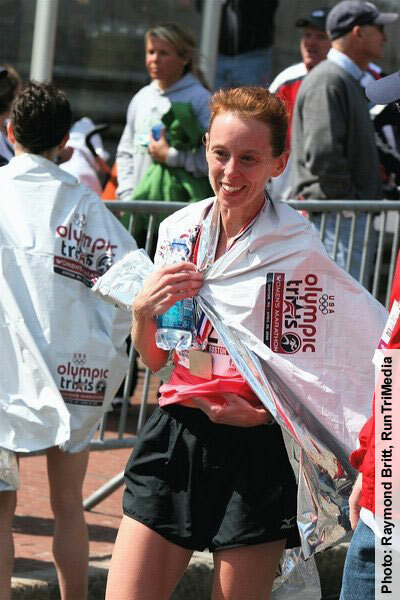 Inbetween those two 26.2 mile trips, she fell in love with — and excelled at — triathlons. Now, after a bout with injury earlier in the year, Jill is recovered and training at full bore for a Trials qualifier. 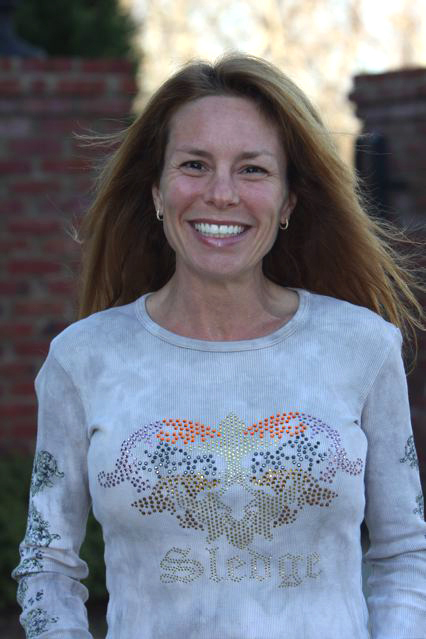 Today I’m talking with Jill Howard, who’s in Highlands Ranch, CO. I wanted to start with what is the biggest distinction between you and the other runners I’m talking to, which is your unusual path to the marathon. You started out with an initial marathon in the mid-1990s. Then you did some shorter races over the next few years. Then it looks like you plunged headlong into doing triathlons after that. I’m interested to know what first compelled you to try a marathon when you were in your mid-twenties. My dad had always told me what a natural athlete I was and how quickly I learned a new sport or took to outdoor ventures. He had me skiing and backpacking at five years old, and I learned things by watching my two older brothers (four and seven years older than me). As a kid, I was fearless to try new things, and I’ve always been very adventurous. I learned to take on pretty much any outdoor activity that we tried. I was very determined to do what they were doing, to be tough, to do things well, to not be “girly” about it, and to not be left behind. But because of various circumstances in my life I don’t believe that part of me — the athletic part, which is a huge part of me — was nurtured. I spent too much energy chasing emotional wounds and the approval of others, instead of honoring the gifts within me. My parents were divorced and lived in two states so I wasn’t in any one place long enough to join a team, or hone a sport, other than the dabbling I did on swim team, drill team, gymnastics, etc. I did buffet style, but nothing specific. So it was an ability that was swept aside. And Olympic desires I had since the 6th grade were pushed deep inside to be ignored for a long time. I remember thinking, “I don’t care what sport it is, I just want to go to the Olympics.” I even drew myself a medal. Ripping up the road during the bike portion. What I’m starting to realize is that this dream has followed me throughout [my life]. It kept popping its head up, this Olympic desire. And I kept shoving it back down. For whatever reason: I didn’t think I was good enough; it wasn’t nurtured; I didn’t have the opportunity; I didn’t know how to pursue it. It was that summer that I was introduced to triathlon by a guy named Ian Adamson, who is now considered to be the most successful adventure racer of all time. I was ecstatic to learn from an elite and to have opportunities opened for me that I yearned for. He kind of taught me the ropes and then I was addicted. I also got a letter in the mail from the Leukemia Society to try a marathon. So I just thought I’d dive headlong into these awesome opportunities to try a marathon and try it all – this was a whole new world bringing alive a side of me I had dismissed, and that came so naturally. It seemed to express who I truly am. And, I loved it! It was redeeming me. Did you have any running experience before this? No, I hadn’t had much running experience. But I considered myself to be very athletic and I felt like it was just something in me. As I mentioned, I grew up with two older brothers and in the summertime we would do all kinds of outdoor things. I felt like I could take on pretty much any athletic challenge, or at least had the determination to try. You’re very accomplished in triathlon in the over-35 age group. 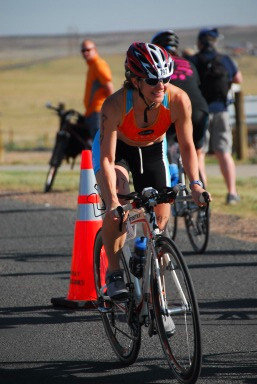 [Jill was the 2007 National Sprint Triathlon Champion in the F35-39 age group.] So obviously you got over that assumption [that you weren’t “good enough”] at some point. Well, it did help when I gained athletic sponsorship from various companies. This year I’m honored with serving on Team Aquaphor, which is an awesome brand that I already love. Tammy Lifka trains with her friend, and fellow Chicago area runner, Julie Wankowski. Both are currently under the guidance of coach Dan Marks. I spoke with Tammy via phone for a little over an hour. It was a very fast hour. I’ve posted audio of our interview, which is also transcribed below. The transcription is edited in spots to cut down on my own rambling questions. You can hear them in their entirety in the audio. I wanted to start by asking you about your athletic background and how you’ve developed as a runner. I know you’re sort of a latecomer to competitive running, having jumped into a 20 mile race on what seems like kind of a lark in 2006. it sounds like you were fit in terms of having done some running and gym work before. But you hadn’t run more than about 7 miles. So that was quite a jump. Can you talk a little bit about that? I had three kids and I was going to the gym at the time and doing spin classes. The most I was running was getting on the treadmill for three miles. One of my best friends from college, Missy Pieper, lives in Madison, WI, and I like to go visit her. She called me up in the beginning of June and asked me if I wanted to to this 20 mile walk/run race. It’s called Syttende Mai, and starts at the capital and you run to Stoughton. I was told it was very hilly. 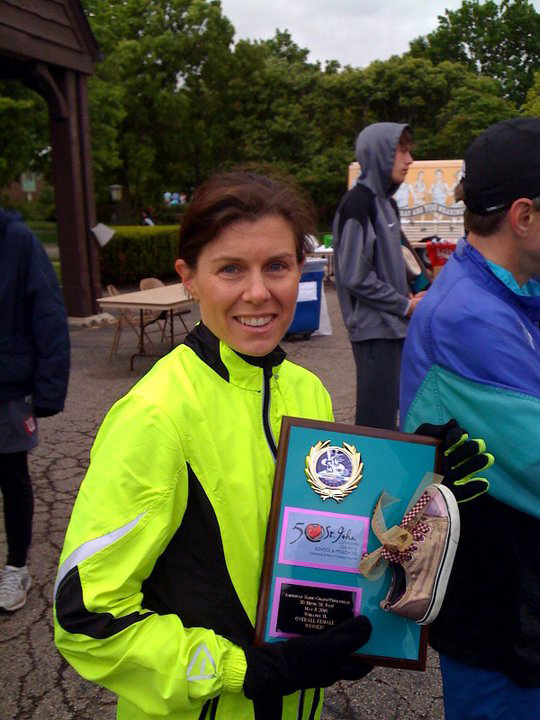 Women's winner, 50 Hecto & American Slide-Chart 5K Run (May, 2010). In my mind, I was thinking we could at least walk it. I signed up and did all the rookie things. We went out the night before and had fun, and had no idea what to expect. I didn’t even own a running watch. No idea or thoughts of pace. It was very on a whim. I did have a PowerBar, which was good. The night before we had a plan, what we should do. And I said, “When I run on the treadmill, I can run a 9:00 pace. I’m pretty good at that. Why don’t we do that?” And Missy said, “Sure.” So for the first 4-5 miles, we were running between a 9:00 and 9:30 pace, right on track. Then right about mile 8, we started to run/walk. After doing that for a few miles, I either wanted to walk or run. It was driving me nuts, walking and running. So I said I wanted to just walk or run. Missy said, “You don’t even seem tired. You seem fine.” She saw some friends walking on the side and said, “Go ahead. Go run. Go do this. See how far you can take it.” So I went ahead and kept running. And every mile I kept going I was very surprised. I had no idea what pace I was doing. I finished running the whole thing at what turned out to be a 10:00 pace, but we were walking inbetween. I was amazed I did that. It seemed like it wasn’t real. I had no idea, no expectations and didn’t even think I could run 6 miles. How did you feel at the end of the race? Did you feel completely exhausted or did you feel good throughout the whole thing? I felt pretty good the entire race. I did take the water and Gatorade on the course. I felt like I ran the last 10 miles complete, without stopping. It was a lot of fun. After that, after going back home, the questions started: “If you can run 20 miles, can you run 26?” So that’s how it started. I don’t think if she hadn’t called me up I would have even started. I didn’t even comprehend 20 miles in my mind. Jaymee has been in the periphery of my running vision for quite awhile. My coach had mentioned her to me when we first started working together. Then Jaymee started chronicling her quest for an OTQ last year on her humorous, informative and eloquent blog, RunAwayFastJaymee. We’ve not yet met, but Jaymee was the first person I thought of when the idea for Houston Hopefuls came to me on a run. And so I decided she should also be my first interview. Unlike a lot of people who pursue an Olympic marathon trials qualifier, you haven’t been running all your life. When did you start running and why? I started running in the summer of 2004 mostly to see Devo in concert. Nike sponsored a series of 5K races called the Run Hit Wonder 5K where they featured 80s one-hit-wonder bands throughout the course. It just so happened that the race was going on in Portland the weekend before I was going to be in the area for work. My brother lives in Portland and told me about the race. The experience was fantastic: I saw A Flock of Seagulls at mile 2 and Devo performed after the race. The experience was a life changer for me. I was super impressed with myself for placing 18th in my age group with a time of 25:54 for the 5K. My brother later that day revealed his ambition to run a half marathon in the fall. I was intrigued by this goal and dared myself to try to do the same. Up until that point in my life, I really hated running. Having a goal as lofty as running 13 miles in a row without stopping seemed like a serious challenge. I picked a local half marathon that October and used a Hal Higdon training program that I downloaded from the web to slowly build up to a long run of 10 miles the weekend before the race. I ran the half marathon at a faster pace than my 5K of two months before, finishing in 1:44. I realized during that training cycle that the reason I had hated running was because I had never run long enough. I now loved running long (>6 miles) though I still found the feeling I had for the first few miles of running to be excruciating. I decided to just continue on with my training program and to tackle a full marathon that December. I averaged 19 miles of running per week with a peak volume of 26 miles and no other supplemental training for the two months leading up to the California International Marathon (CIM) in Sacramento. I finished in 3:41 and qualified for Boston. 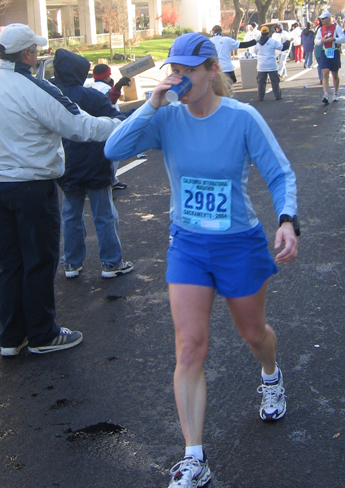 En route to the finish, CIM 2004. Then how long was it before you started training and racing seriously? After CIM 2004, I told some people about my accomplishment, and they seemed surprised at what I had done. This made me wonder whether this was a fluke or if I could get even faster at the marathon distance. While I was training for the 2005 Boston Marathon, I ran across some information about a racing team sponsored by a local Fleet Feet running store. I stopped in at the store and joined up. I would say that joining that team marked the beginning of my serious training and racing. Was there a particular event that got the wheels turning in terms of thinking you could qualify for 2012? I actually decided I was going to shoot for an Olympic Trials Qualifier (OTQ) soon after my first marathon. In Dec 2005, I ran CIM again and got my time down to 3:20. I did the math and decided that all I needed to do was knock another 33 minutes off of my time, and I was in there like swim wear. I had chopped 20 minutes off in one year, so this seemed like a reasonable prospect to me. For a number of reasons, I did not get my marathon time down enough to qualify for the 2008 Trials (I ran 2:55 in April 2008), but I did try and I never stopped believing. You’ve made huge leaps in your racing times relative to your experience and age. Do you attribute any of this to having an innate gift or predisposition to being a good distance runner, or is it all due to hard work? It’s definitely a combination of good genes and hard work. I don’t think I work much harder than many of the other fast runners I know, but I have poured a lot of energy into this pursuit. I have dedicated a big chunk of my life these last 5 years to training and doing the maintenance work necessary to be able to continue to train and race hard. But hard work only goes so far. Going from couch potato with zero running experience to a 2:46 marathon in 5 years is unusual progress that indicates some small amount of added talent. Have you progressed at the rate you’d hoped to? As I mentioned above, I was shooting for an OTQ for 2008, so I guess I’d have to say that I didn’t progress as fast as I had calculated initially. However, I’d like to think that was just an arithmetic error. I always believed I could run under the standard of 2:47 and had many people telling me the same. When I finally ran a 2:46 marathon at the Twin Cities Marathon, I felt like I had reached a major milestone even though I didn’t quite qualify for the trials under the new standard. That 6:22 pace had been locked into my psyche for so many years that it was a huge accomplishment for me to finally run a marathon at that pace. Use this banner on your own web site to link to us! Header photo courtesy of Tavia Kowalchuk.